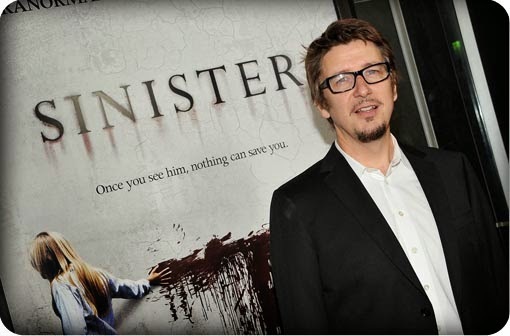 Scott Derrickson is a Christian and prominent Horror movie director who intertwines theological themes with his horror films. He is most famously known for his films The Exorcism of Emily Rose (2005) and Sinister (2012), and is slated to take on a Stephen King story and a biblical story. G.K. Chesterton, C.S. Lewis and Tolkien are clear influences in his work, among others. So far his focus has mainly been on the demonic and evil, with a tension between a fairly healthy dose of reason and the supernatural/paranormal, though often ending up with an acceptance of the latter. To me, the horror genre is the genre of non-denial. It's about admitting that there is evil in the world, and recognizing that there is evil within us, and that we're not in control, and that the things that we are afraid of must be confronted in order for us to relinquish that fear. And I think that the horror genre serves a great purpose in bolstering our understanding of what is evil and therefore better defining what is good. And of course I'm talking about, really, the potential of the horror genre, because there are a lot of horror films that don't do these things. It is a genre that's full of exploitation, but the better films in the genre certainly accomplish, I think, very noble things. How do you avoid what some might consider a fascination with evil? Derrickson: It's something I've thought a lot about. I think of this kind of material in an almost dietary fashion. It's something that is potent and powerful and it's not healthy for anyone to overindulge in it. I would be concerned if one of my children were constantly watching nothing but horror films or indulging in gothic literature without the balance of other types of art and entertainment. I do think that's a danger. C. S. Lewis had that very practical wisdom, well stated, in his introduction to The Screwtape Letters, when he talks about how the two great dangers, in regard to our thoughts about the demonic and the devil, are to think too much of them or too little of them. To be too afraid of them, to be too hesitant to engage in discussion or thought or art that deals with this realm, is to give in to fear; but to become fascinated with it and to indulge in the material is also very unhealthy. So for me personally, I stagger the kinds of material that I do. I've written in other genres, and if I'm working on a project like the one that I just did, during the course of working on it, I don't watch any horror films, I don't read any scary literature, I try to fill myself with things that are a bit brighter, to keep myself personally balanced. But I think that both kinds of material are important for a balanced diet—at least for me. It's been said that "The Passion of the Christ" was very popular with horror audiences. Do you have any perspective on that? Derrickson: I do. It's very gothic, a very dark film. And I think there are people who just have an inclination to want to see material that deals with that aesthetic. And yet I think that film also ought to be regarded by Christians as a horror film. I think the crucifix is gothic iconography, and yet what I love about the horror genre, what I love about gothic iconography, what I love about gothic literature, is the potential that it carries to blend with it beauty and meaning. And when beauty and meaning are combined with the horrific, you get things like the cross, and you get things like medieval art, and you get things like Dante's Inferno. And it is something that American evangelicalism has abandoned, for the most part—to their own detriment, because I think the result is, we have left gothic imagery and the power of that aesthetic to Catholics and to non-Christians. Not that Catholics are non-Christians—I think most Catholics are Christians—but my point is that there is a great value in that aesthetic and people need that. I think that the history of the Christian church is one that is marked by an understanding of this. When I went to Europe a few years ago, I felt very at home there, and I loved standing in Notre Dame and looking at all the gargoyles on the outside of that building, and realizing that, as scary and frightening as they were, what I was looking at was something that was built to the glory of God. How did your interest in the horror genre begin? Derrickson: When I was in film school. I knew that I wanted to integrate my faith with cinema in some way that was relevant to the culture. And I was looking for a way to do that, and I had just re-read The Screwtape Letters, and within the same year, I read Walker Percy's novel Lancelot, and there was a line in Lancelot that said, "'Evil' is surely the clue to this age, the only quest appropriate to the age. For everything and everyone's either wonderful or sick and nothing is evil … God may be absent, but what if someone should find the Devil?" It really started to resonate with me, that this was the genre where a Christian could connect with mainstream culture, and there was potential there to not preach to the choir—not even preach to the culture, but connect with the culture. And that is certainly what I have been trying to do with a lot of my work. And in the case of The Exorcism of Emily Rose, I was very committed to not making a movie that was intended to give spiritual or religious or metaphysical answers to the audience. I really just wanted to make a film that was going to provoke the mainstream audience to ask themselves what they believe, and cause them to come away from the film provoked to think about and discuss spiritual matters and spiritual issues that I think are profoundly important.